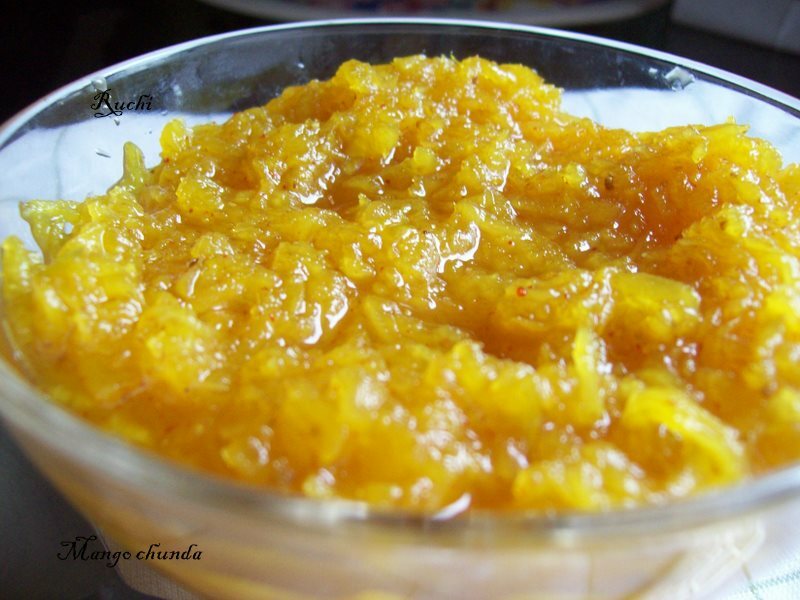 Mango chunda is a preserve that is common to all Gujarati households.Chunda is a judicious combination of grated mangoes and sugar, the quantum of sugar used determined by the sourness of mangoes. 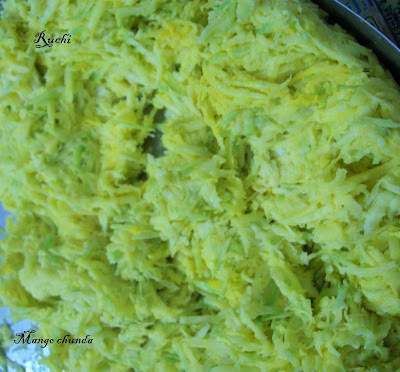 The traditional preparation of chunda is time consuming, , the pickle is kept out in the sun for 20-30 days to 'cook'. Each day it is given a good stir, covered and placed in a sunny spot, then brought indoors at dusk. The sun makes the sugar in it melt to a syrupy consistency and the grated mango turns transparent! Since most of us don't have the time.I used to do chunda in cooking method. here is a quick and less time consuming version of the recipe. 1.Wash ,wipe dry , peel and grate mango. 2.Combine the grated mangoes, salt and turmeric powder and leave aside for 15 minutes. 3.Add the sugar little by little(2 tablespoons at a time) to the mango mixture and stir continuously using a spoon or a whisk till all the sugar is nearly dissolved. 4.. Once the sugar is dissolved, put the mango-sugar mixture into a large, heavy-bottomed pan and set up to cook on medium heat. Stir often till the sugar turns syrupy and small bubbles appear on the surface of the mixture.. I should get to a one-thread consistency. 5. Remove from the flame and let the mixture cool completely. 6.Add chilli powder and cumin seeds and store in a sterilised glass jar. Store upto 1 year in cool dry place. 7. 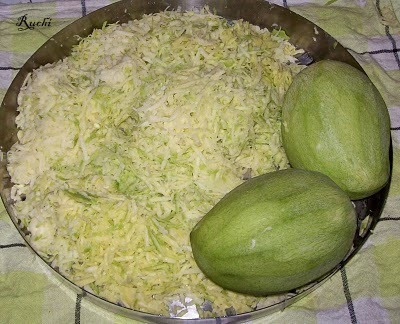 Chunda is now ready to be served with chapatis,thepla and fulkas etc. 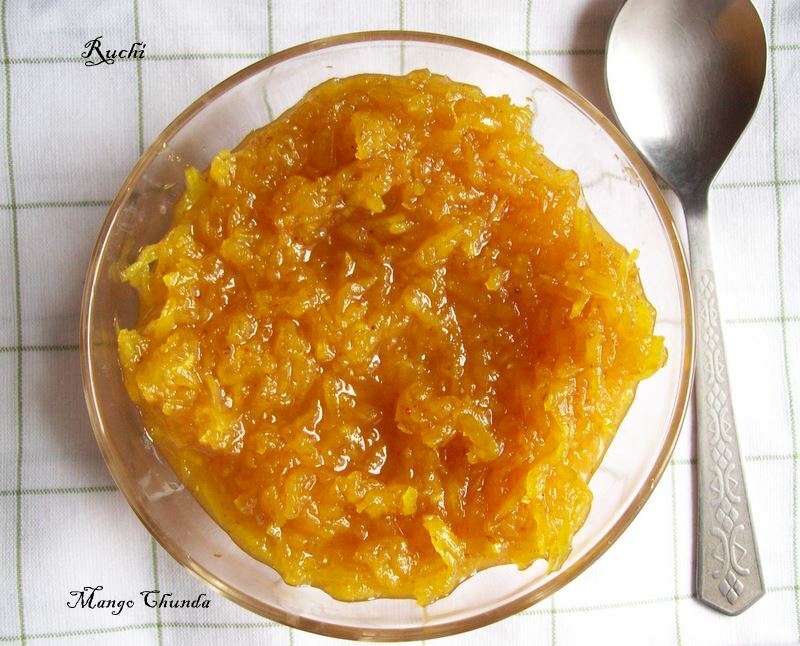 In a huge vessel or glass jar mix the shredded mangoes and sugar and allow to cook in the sun. Do not seal the jar but tie a cloth on the mouth to keep out the dirt. Put it in direct sunlight till you get transaparent raw mango shreds and the mix is sticky like honey yet crunchy in taste. Every day put the jar in the sun and in the evening bring it indoors to mix it well. Do not leave the jar out at night as dewdrops might get into it and that will spoil the preserve. Once the mix is stringy and finally you are ready to store it for the year mix in the salt, chilli powder, and cumin seed powder. Tongue tickling mango chunda, yumm! Mouthwatering, sweet & tangy pickle!!! !